Grandview cape cod for sale! Stunning Grandview cape cod with luxurious updates from top to bottom! 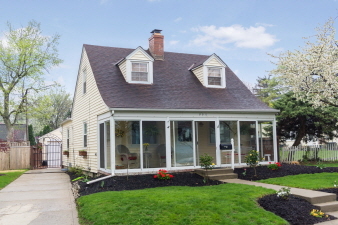 Upgrades include ¾ “ solid oak flooring, new carpet, LG SS appliances, Jacuzzi tub, newer furnace & a/c, new hot water tank, upscale finished basement with egress window and full bath, newer 1st floor windows, roof 2005, newly remodeled kitchen with granite counters in kitchen, buffet and fireplace. Newly installed Watchdog Battery backup sump pump. Newer electric and plumbing. Custom built arbor and Garden Shed. Three season front porch. Custom woodworking throughout home. Attention to detail throughout, must see to appreciate! Spectacular patio/entertainment area behind house with hot tub. Plumbing ran to 2nd floor - ready for master bath. Exceptional location close to Grandview Yard.